Because I’ve been reading about jazz for decades, I prefer books that offer first-hand information rather than pastiches of familiar quotations. Reading a revered musician’s own words is a special pleasure. A new book presenting the reminiscences of pianist Jess Stacy is a delight. It’s called CHICAGO JAZZ AND THEN SOME: AS TOLD BE ONE OF THE ORIGINAL CHICAGOANS, JESS STACY. The author is Jean Porter Dmytryk — who, with her husband Edward (the film director), had the good fortune to live next door to Jess and his wife Patricia from 1951. The book was published in 2010 by Bear Manor Media, and you can find it through their site — http://www.bearmanormedia.com., or through Amazon. It’s only 138 pages, but it contains more new information — and wonderful rare photographs — than many jazz books weighing three times as much. Those who love cats will find especially endearing the photograph of the Stacys’ cat, Dollface, peering over the top of the music as Jess plays the piano at home. Worth the price of admission. And what comes through on every page is the affection Jess had for his neighbors and his pleasure in telling his stories. The book takes Jess from his childhood in Cape Giardeau, Missouri, up to his 1974 triumph at the Newport Jazz Festival (I was there, and can testify that he played beautifully — solo and with Bud Freeman), and the back cover mentions that he celebrated his ninetieth birthday with the Dmytryks. In between there are some stories we know well — Jess’s first meeting with Bix Beiderbecke and his sorrow at Bix’s death, his urging Benny Goodman to keep on going to California and the band’s triumph at the Palomar Ballroom, his eventual retirement from the music business and later return to New York. But for every familiar story there are five brand-new ones. Stacy was a keen observer of Chicago nightlife and of the gangsters he worked for: so there are sharply-realized, often surprising sketches of Al Capone, Machine Gun Jack McGurk, even of John Dillinger’s body in the morgue. Decades after he had left Chicago, Jess would still call the intersection of Thirty-Fifth and Calumet “the center of the universe” and speak fondly of King Oliver, a young Louis Armstrong, of how George Wettling was punished by the gangsters for bad behavior. And the stories aren’t all about jazz musicians: Sally Rand and Texas Guinan make appearances, as does a forgotten singer named Muriel Leigh who tried to pull a fast one, and two singers who would become deservedly famous — Frankie Laine and Doris Day. Other personalities — occasionally helpful, more often frustrating — are seen at close range. I speak of Benny Goodman (Stacy’s association with the King lasted a quarter-century but was often unhappy) and Lee Wiley (their brief but nearly toxic love affair, marriage, and musical partnership). Those who rhapsodize over Wiley might find the pages where she appears startling, but the stories have the ring of truth. But Jess is never mean, never vindictive. Readers will be moved by Jess’s close friendship with Frank Teschemacher (who else could have told us what Stacy does? ), his affection for Wingy Manone and Jack Teagarden, for Muggsy Spanier and Wettling, for Bessie Smith, Bunny Berigan, Ella Fitzgerald, and Tommy Dorsey. The story of Jess’s long-time romance with Patricia Peck (with enough twists and turns for a perfect 1946 movie) is a highlight of this book. Unlike the stereotypical jazz musician, he recognized true love — and even though he almost lost it, it couldn’t be stifled. Stacy seems a cheerful, down-to-earth person, someone we would have been honored to meet, someone who would have made us feel at home in a sentence: a man who can say that he had liked gin and tried pot, but that nothing beats a Hershey bar. Two other biographies of Stacy have already been published, but even if you own the admirable books by Derek Coller and Keith Keller, make room on your shelf for this one. P.S. Perfectionists will see that Jean Porter Dmytryk is not a polished writer. Jazz scholars will notice some inaccuracies. But the pleasure of hearing Jess Stacy tell his own stories far outweighs any flaws in the book. This entry was posted in "Thanks A Million", Irreplaceable, Jazz Titans, Jazz Worth Reading, Swing You Cats! and tagged Al Capone, Bear Manor Media, Benny Goodman, Bessie Smith, Bix Beiderbecke, Bud Freeman, Bunny Berigan, Carnegie Hall, Chicago, CHICAGO JAZZ, Dollface, Doris Day, Edward Dmytryk, Ella Fitzgerald, Frank Teschemacher, Frankie Laine, Gene Krupa, George Wettling, gin, Hank O'Neal, Hershey bar, Jack Teagarden, Jazz Lives, Jean Porter Dmytryk, Jess Stacy, John Dillinger, King Oliver, Lee Wiley, love affair, Machine Gun Jack McGurk, Michael Steinman, Muggsy Spanier, Muriel Leigh, Newport Jazz Festival, Patricia Peck, pot, Roaring Twenties, Sally Rand, Texas Guinan, Tommy Dorsey, Wingy Manone. Bookmark the permalink. Many thanks for this information, which I shall follow up. He was always a hero of mine, and when the Whitney Balliett “Back From Valhalla” was published I wrote to Mr Stacy, receiving a nice note in reply. Once when passing through Los Angeles (I was then living in Auckland, New Zealand) I got up the courage to ring him. I have the Coller biography, and the CD which came with it is wonderful. I still can’t listen to his “Sing Sing Sing” solo with a dry eye. Thanks for this – The impression I always get from any photo of Jess was a basically decent man – his whole being That great smile and those ” honest” eyes seemed to exude a constantly cheerful spirit. I’m going to Barnes & Noble tomorrow ! To just imagine all the people he knew and worked with in all those years ! Thank you SO much ! I’ll probably be considered cruel by my own pianist, but Jess would be my dream player, and this book will bring him back for a little while, I’m sure. Sorry, Alek! Jess Stacy is relatively unknown to so many, yet he was was one of the best jazz/swing pianists of his time. 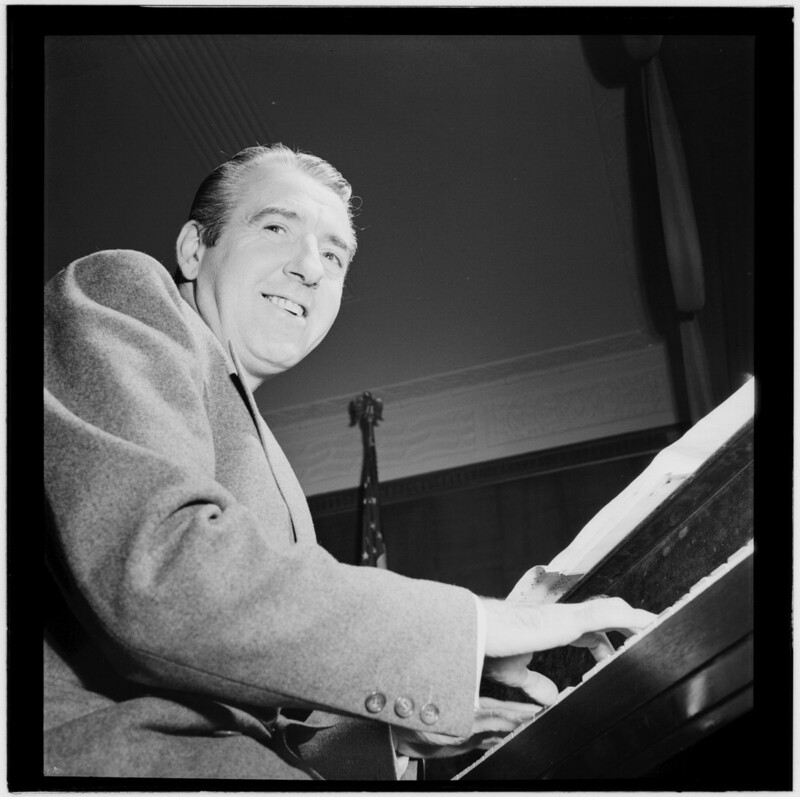 One has only to listen to his solo on the Sing, Sing, Sing number during the 1938 Benny Goodman Carnegie Hall Concert to appreciate his sense of timing which was superb. He needs more recognition and I’m glad to see that someone has something about it with this book! “You know he was your Dad’s favorite pianist.” I wish I had known; my musical career might have taken a very different turn!